Plot: Desperate to draw attention to the local police's lack of caring for her daughter's murder a woman spells out her anger in three billboards and discovers that anger runs deep in these parts. One of the most emotionally powerful, bleakly comedic films in recent memory, Three Billboards is a resounding success and one that will leave you captivated, heartbroken and overwhelmed by the power of the human spirit. 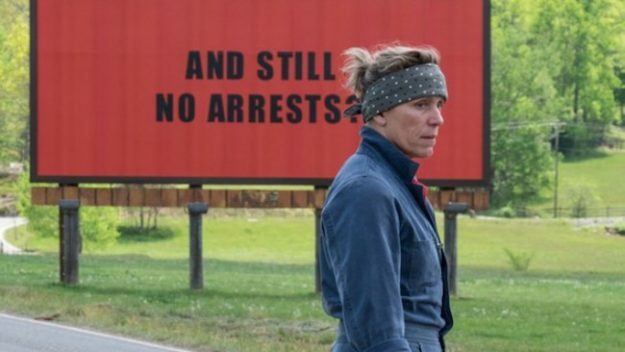 On paper Three Billboards Outside Ebbing Missouri is a film very much of the times. Specifically a time when Donald Trump is the “Leader of The Free World”. A film that deals with freedom of speech, police brutality, racism, and injustice in the good old US of A. But while Three Billboards is undoubtedly a product of the times it is also a film that captures the beautiful mess that is America. The themes displayed here are the same ones the likes of Bruce Springsteen and Bob Dylan have been singing about for decades. Months have passed since Mildred’s (Frances McDormand) daughter Angela was raped and killed in the titula town. With no arrests made the local police have seemingly given up the case. So Mildred takes matters into her own hands. Erecting three billboards that call into question the ethics and duty of the local officers. In particular chief of police Willoughby (Woody Harrelson) who has just been diagnosed with cancer. Determined to protect his chief, racist police officer Dixon (Sam Rockwell) wants to go in all guns blazing, but what everyone soon realises is the anger Mildred is experiencing is endemic of the town. Darkly comic and powerfully poignant, Three Billboards is a musing on grief. There is a line of dialogue spoken by Sam Rockwell in Three Billboard director Martin McDonagh’s Seven Psychopaths that echoes here. When discussing the concept of an eye for an eye leaving the whole world blind Rockwell’s character posits that “no it doesn’t, they’ll be one guy left with one eye”. Both that tone and its dark implications perfectly capture Three Billboards. That sense of everyone trying to have their pound of flesh and no matter who wins, everyone loses. Foul mouthed and often brutal this is quintessential McDonagh. One minute funny, the next thought provoking and painfully heartbreaking, it is the kind of film that has you laughing at one point before suppressing tears at something as simple as the gesture of forgiveness. Without exception the characters are flawed, but it is in their flaws and their attempts to better and redeem themselves that you fall head over heels in love with them. It is a visual treat, Ebbing becoming a place you’d want to visit, such is its picturesque nature – there’s even a gift shop – but never stay, such is the depths of racial hatred and bigotry on offer. The stark red of the billboards becomes so powerful as the film unfolds their visual meaning fluctuates and overpowers in the most devilishly subtle ways. Without exception the performances are captivating. Harrelson delivers a stunning performance full of warmth and tragedy. 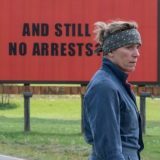 McDormand carries the film as the bitter and twisted Mildred, her anger is what fuels the film and your love for it, forgive her for it and, ultimately, root for her to find comfort in accepting that injustice is part of the world. Even when she’s being unreasonable you cannot but ache for her such is the level of grief and anger you can so easily relate to. Meanwhile Rockwell plays a racist, backwater idiot who by all accounts you should hate but somehow he makes him ignorantly forgivable and curious.